Toyota develops a new 2.0-litre class TNGA-based powertrain unit. The powertrain unit's continuously variable transmission (CVT) utilizes an unprecedented1 mechanism that significantly improves driving and environmental performance. By the end of 2023, Toyota intends to install TNGA-based powertrain units in approximately 80 percent of Toyota vehicles sold annually in Japan, North America, Europe, and China, thereby reducing CO2 emissions from Toyota vehicles by 18 percent or more2. TORONTO, ONTARIO, February 28, 2018 – Toyota Motor Corporation (Toyota) announces that it has developed a new continuously variable transmission (CVT), 6-speed manual transmission, 2.0-litre engine, 2.0-litre hybrid system, and 4WD systems based on the Toyota New Global Architecture (TNGA), a development framework aimed at making ever-better cars. The new technologies offer both superb driving performance and high environmental performance. The new powertrain unit features the world’s first launch gear in a passenger vehicle CVT1, which facilitates improved transmission efficiency in lower gear ratios where belt efficiency is poor. The transmission system utilizes gear drive when starting from a full stop, resulting in powerful acceleration while at the same time resolving the momentary sluggish feeling that was previously present during accelerator operation. Both smooth and comfortable launch performance are realized. When switching from gear drive to belt drive, the transmission system uses highly responsive gear change control technologies cultivated from AT technology. In line with the adoption of a launch gear, belt use is now specified for higher gear ratios. This new setup not only improves the efficiency of belt use, but also enables the adoption of wider gear ranges, thereby realizing a class-leading gear ratio range of 7.5 for the 2.0-litre class1. Toyota has also developed a new manual transmission in response to global needs, particularly those in Europe. Compared to the existing version, the mass of the new system has been reduced by seven kilograms and total length by 24 millimeters. This makes it one of the world’s smallest transmissions1, and its small size contributes to improved fuel efficiency. The 6MT also offers world-leading transmission efficiency1, while the use of iMT (Intelligent Manual Transmission) controls, which automatically adjust engine rotations when changing gears, ensures smooth gear shifting—free of uncomfortable recoils—for the driver. 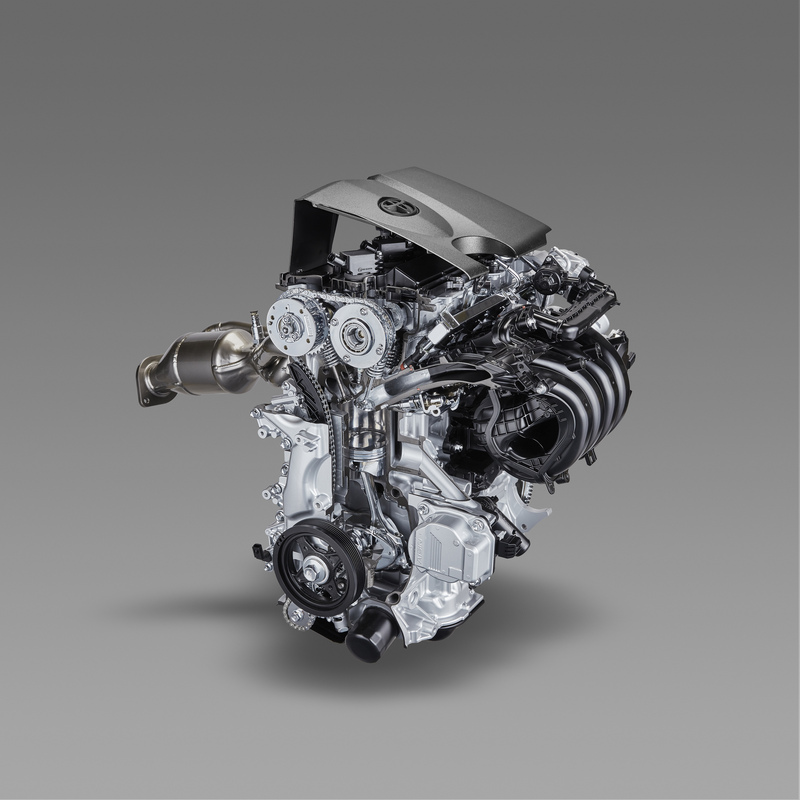 Toyota’s new Dynamic Force Engine adopts high-speed combustion technologies and a variable control system. It also achieves greater thermal efficiency, resulting in high output, due to a reduction in energy loss associated with exhaust and cooling systems, the movement of mechanical parts, and other aspects. As a result, the newly developed 2.0-litre gasoline vehicle and hybrid vehicle engines achieve world-leading thermal efficiencies of 40 percent and 41 percent respectively1. In addition, compared to existing engines, the new engines achieve increased torque at all engine speeds—from low to high rotations—and will comply with expected future exhaust regulations in each country in advance. Toyota has developed a new hybrid system for 2.0-litre engines, which applies the same size-reducing, weight-reducing, and loss-reducing technologies used in the fourth-generation Prius. The new system realizes improved driving performance while retaining superior fuel efficiency. When accelerating, the hybrid system reduces engine rotations while drawing increased electric power from the battery, thereby delivering a linear and lengthened sense of acceleration. The new Dynamic Torque Vectoring AWD system is used in gasoline engine vehicles. By adopting a torque vectoring mechanism, which independently distributes torque to the left and right rear wheels according to driving conditions, the Dynamic Torque Vectoring AWD system enables the driver to steer the vehicle exactly as intended. It achieves high off-road performance even on the toughest roads. It also incorporates a disconnect mechanism, which features the world’s first ratchet-type dog clutches1 on both the front and rear wheel shafts. These clutches stop the drive system rotations, which transmit driving force to rear wheels when in 2WD mode, significantly reducing energy loss and improving fuel efficiency. The new E-Four system will be used in hybrid vehicles. The system increases total torque to the rear wheels—which are electrically driven—by 30 percent compared to existing versions. By adopting a new control system that optimally distributes torque to the rear wheels based on the driving conditions, the E-Four system offers high off-road performance, handling, and stability. The powertrain units will not only contribute to improved environmental and driving performance of conventional gasoline engine vehicles, but the core technologies will be reflected in the performance improvement of electrified vehicles, including hybrid electric vehicles (HEVs), plug-in hybrid electric vehicles (PHEVs), battery electric vehicles (BEVs), and fuel cell electric vehicles (FCEVs). These technologies play a part in Toyota’s pursuit of the popularization of electrified vehicles. Regarding TNGA-based powertrains, Toyota has already announced plans to introduce 17 versions of nine engines, 10 versions of four transmissions, and 10 versions of six hybrid systems by the end of 2021. The new continuously variable transmission, 6-speed manual transmission, 2.0-litre engine, and 2.0-litre hybrid system represent four of the planned components. Within the next five-years to the end of 2023, Toyota aims to have TNGA-based powertrain units installed in approximately 80 percent of Toyota-brand and Lexus-brand vehicles sold annually in Japan, North America, Europe, and China. Toyota forecasts that the TNGA-based powertrain units alone will improve fuel efficiency enough to reduce CO2 emissions from Toyota vehicles by more than 18 percent. 2Comparison of average amount of CO2 emitted by Toyota and Lexus vehicles sold in 2015 in Japan, North America, Europe, and China and the average amount of CO2 emitted by Toyota and Lexus vehicles planned to be sold in 2023 in Japan, North America, Europe, and China, including vehicles equipped with the newly developed powertrain units. Estimated CO2 reduction contribution made only by newly developed powertrain units based on certified data in each country or region.